The Disney Vero Beach 10K, at least that’s what I called it. 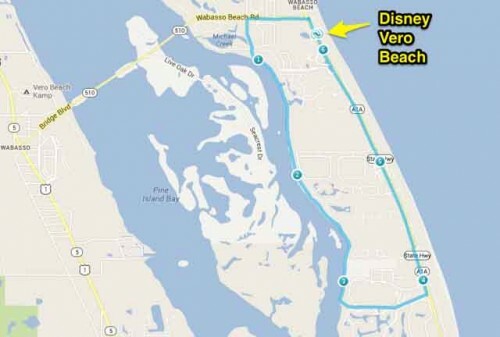 No there isn’t an official runDisney race in Vero Beach, but I did get to spend a week at this Disney beach resort in early September and discovered there’s a near perfect 10k loop right outside your balcony that I got to run it three times. There are only a few turns so you won’t get lost, it’s pancake flat, and has lots of scenery to enjoy that will have you dreaming instead of worrying about the next mile. Start your GPS in front of the lobby and take a right turn, north on A1A, out of the resort entrance, head to the light and take a left (West) on Wabasso Beach Rd, away from the beach. 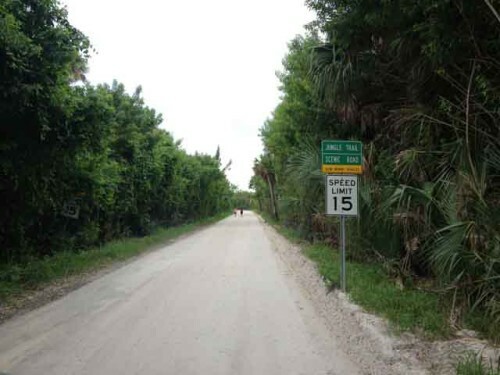 You’ll be running on nice sidewalk here and likely see locals out running from the private communities lining A1A. 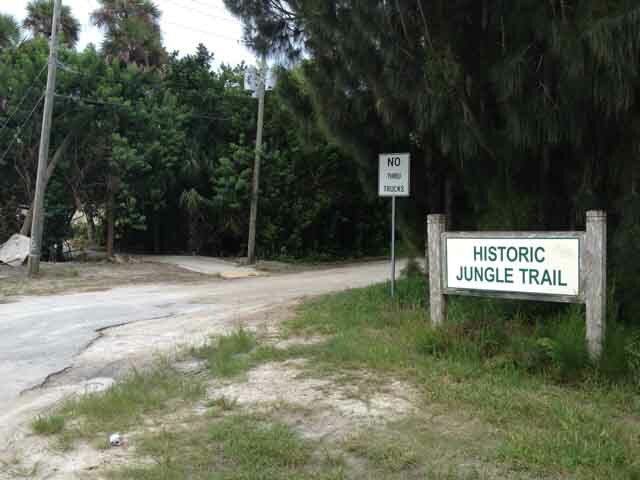 Just a half mile down you’ll come to a dirt road with a big sign that says Historic Jungle Trail. That’s the sidewalk where you’ll turn left and head south. At first you’ll think you’re headed into the jungle because of the vegetation lining both sides of the road, and that sign you just passed. 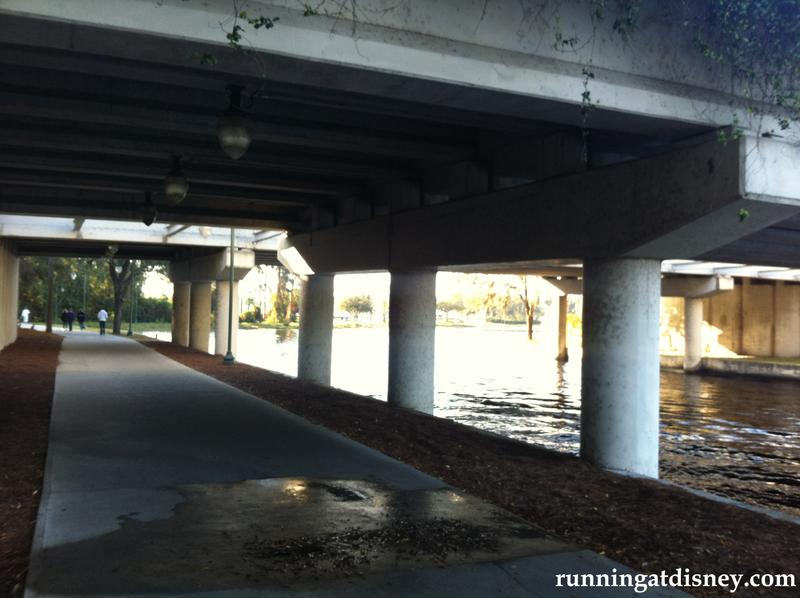 But in just .3 miles you’ll start to see why this is such a great run path. This will be the view you have for the next 2 miles. The “trail” is a wide dirt road that’s in great shape with no holes or deep sand that I encountered, and almost no traffic. If it’s just after sunrise you’ll also have some shade since the sun will be on your left behind the trees it was a little cloudy this morning. 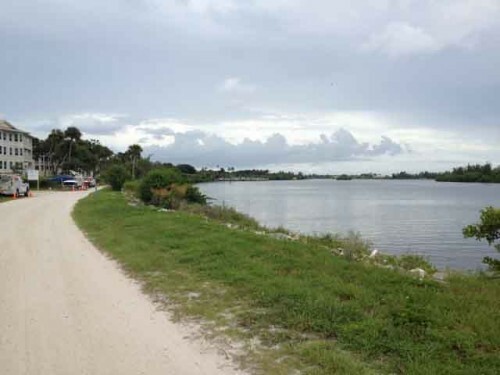 At the end you’ll hang an obvious left onto a paved road and head back east towards A1A and the beach.. Don’t turn right thinking you’ll keep enjoying the beauty, it’s a dead end into a private community. When you get to A1A turn left again and stay on this side of the road, there’s no sidewalk yet on the beach side. But there is plenty of room because you’ll probably see a few more locals out enjoying the morning for the 2 miles or so back to the resort. It’s all private communities the rest of the way, and I even had a few bikes and a golf cart go by. 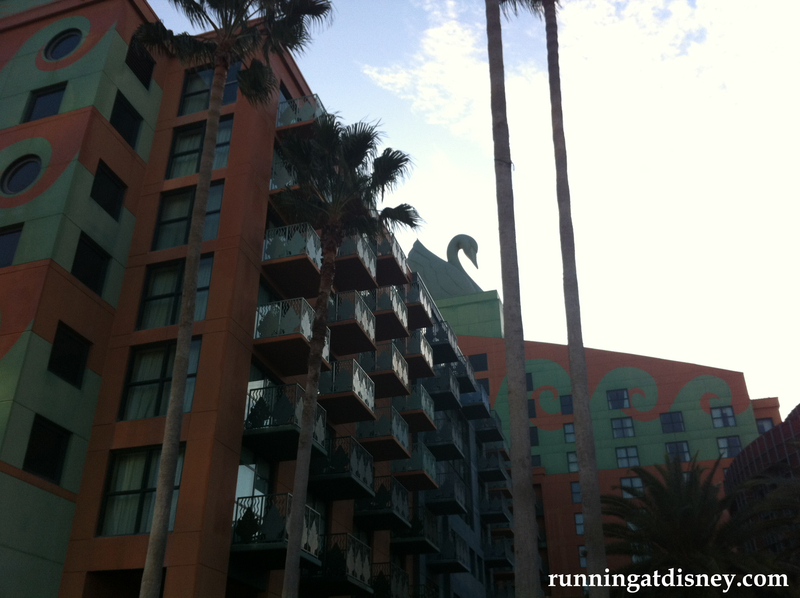 Getting in the front “gate” of this resort is easier than the Orlando properties. Many times there isn’t even a guard in the shack, but you can get to most of the rooms without even passing it. So no worries about digging your room key out yet, it’s way more laid back at this resort. 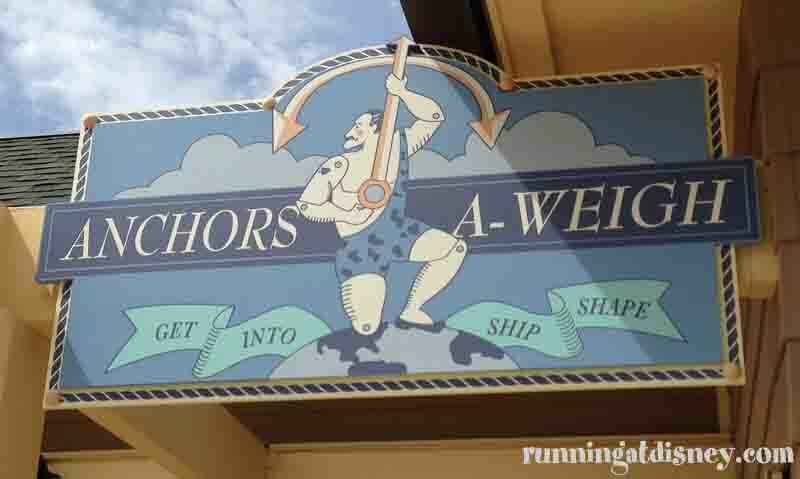 You could turn right towards the pool area though and head to the Anchors A-weigh fitness center and extend your workout on some machines or dumbbells, and if you haven’t gotten enough cardio, hit a treadmill or elliptical. Hope you enjoy your trip to Vero Beach and keep your fitness program up while there. 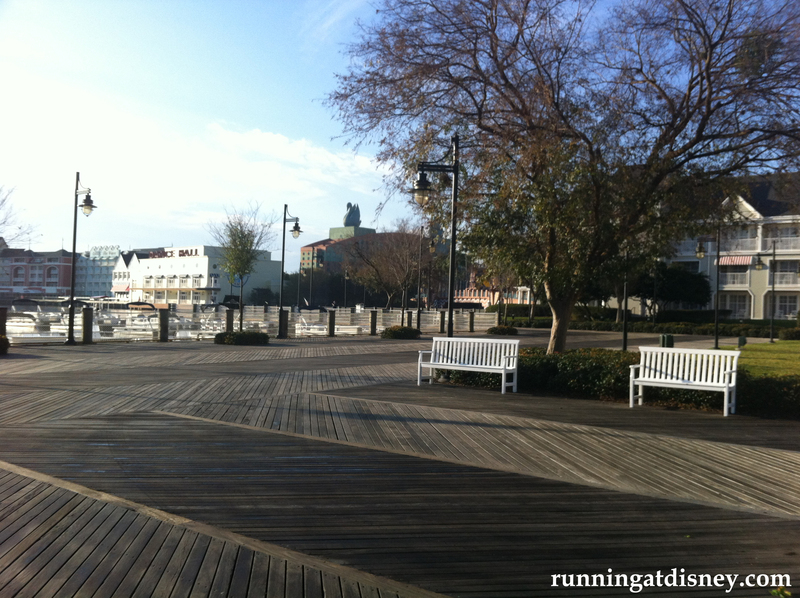 It’s a great place to enjoy the outdoors so running is perfect for exploring the area and seeing the beautiful island. 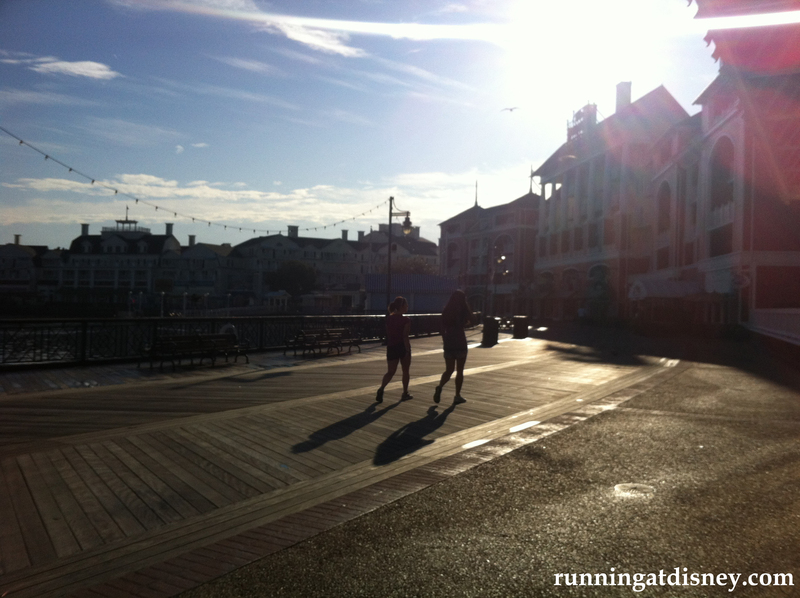 Marc Bigbie is a part time ultra marathoner, part time blogger, and full time Disney lover. Visit www.Bigbie.net to follow some of these passions and more. 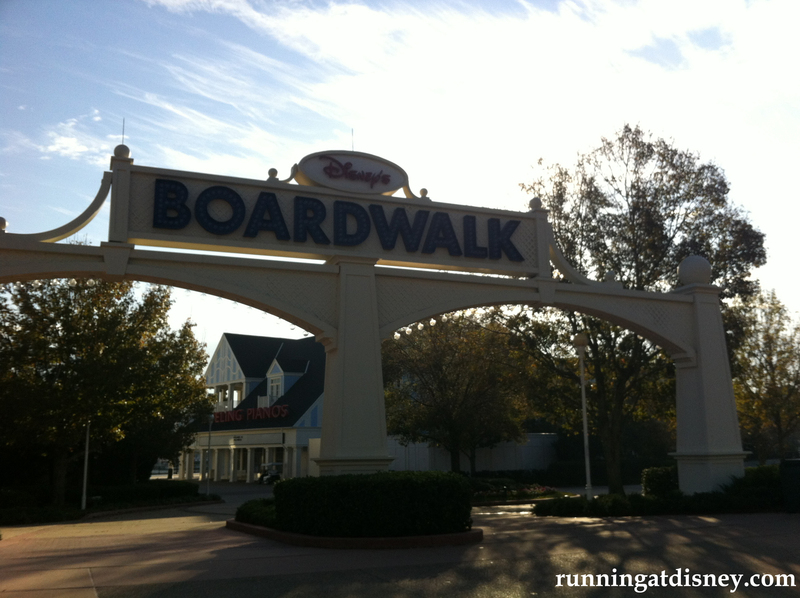 Walt Disney World has some fantastic areas to run while you are on vacation. You shouldn’t have to sacrifice your training schedule while in the most magical place on earth! Almost all of the resort hotels have an area to run and each is very unique. There will always be something new around the corner to keep your attention. Two of my favorites are the trail between Fort Wilderness and Wilderness Lodge, and the trail around the Epcot Resorts and down to Hollywood Studios. 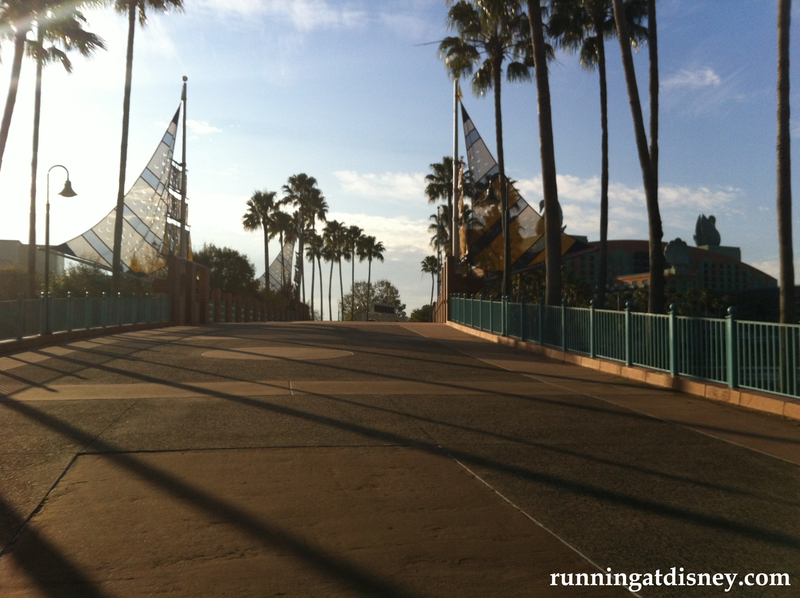 Today, runDisney released a great video showcasing these trails. 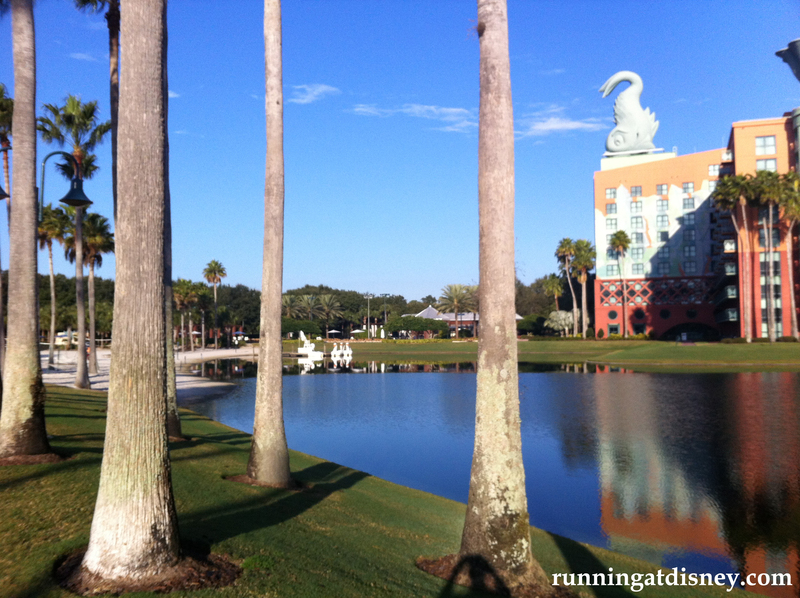 Lori Lovell from the Walt Disney World Mom’s Panel takes us though a few on the best trails and also provides great tips on running at the resort and in the typically hot Florida weather. Check it out! 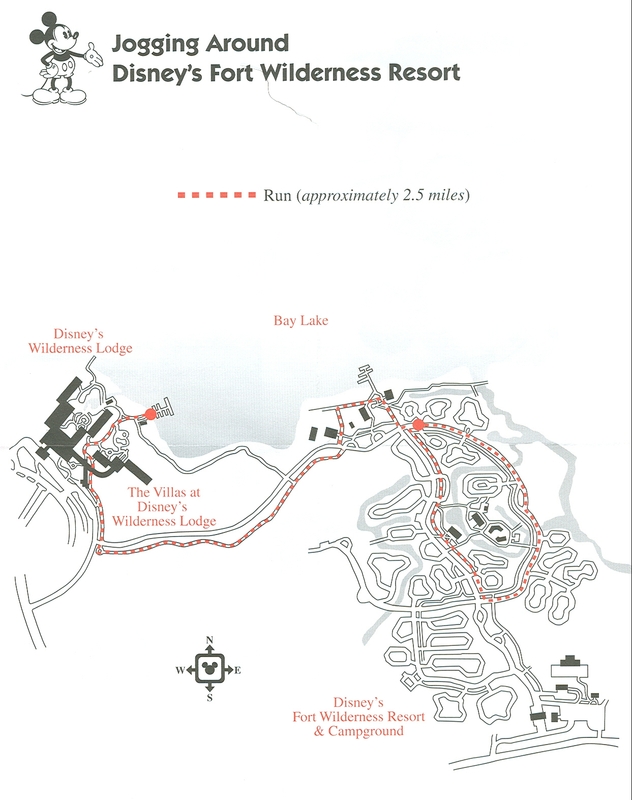 Next time you’re in Walt Disney World ask for a map of the jogging trails at your resort’s front desk or visit my Disney Running Trails section here on RAD for maps and additional information. Hope to see you out there! 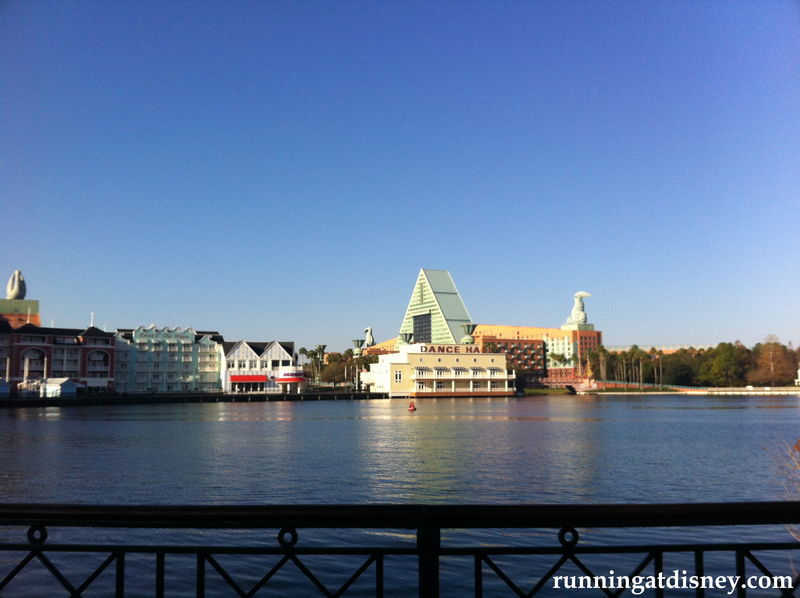 I love the Epcot resort area. It’s home to some of the most beautifully themed resorts, fantastic restaurants (Flying Fish Cafe in particular! ), and picturesque scenery. It’s the perfect escape from the parks to relax and grab a drink. 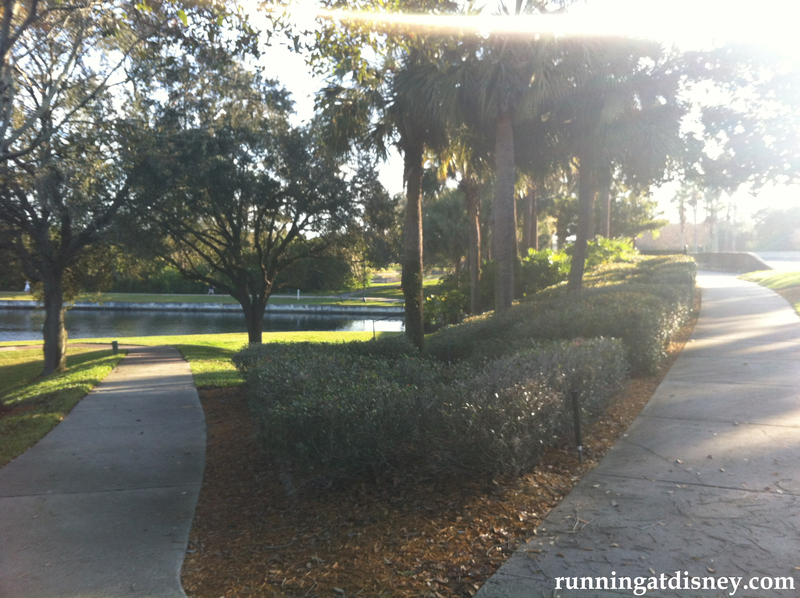 But did you also know that it’s also a great place to run? I started my run by heading counter clockwise towards the Yacht Club. 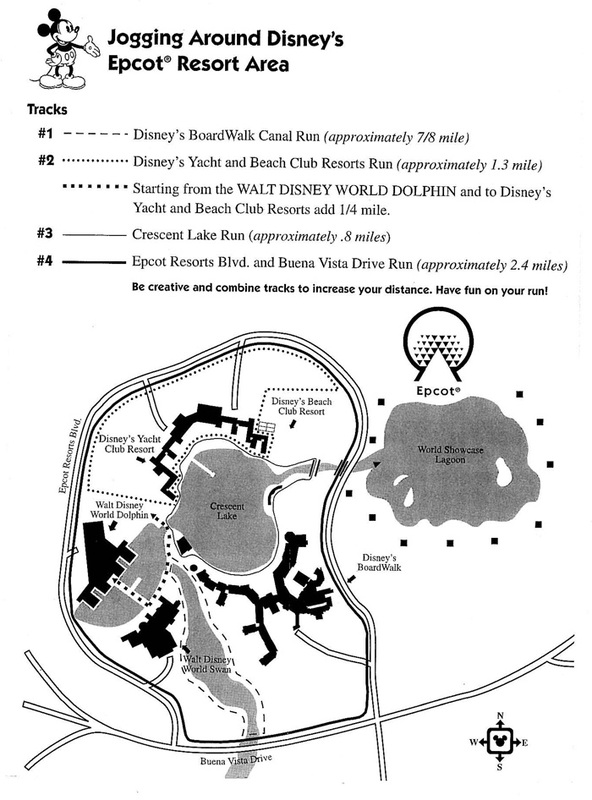 The terrain changes here from a concrete path to a wooden boardwalk, which then curves around towards the Dolphin. This is where you encounter your first hill. The bridges that go over the waterways are deceptively steep and I was certainly not expecting that. Now here is where I got confused. I haven’t been over in this area for years and I had forgotten which paths went where….there are a lot of them. 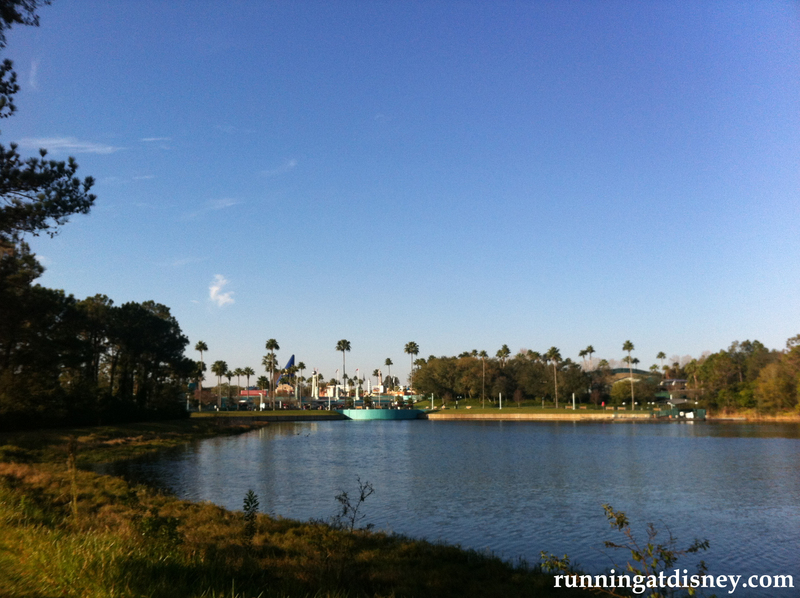 Instead of going left into the Boardwalk area, which also has the path to Disney’s Hollywood Studios, I stayed right and headed towards the Swan. Oh and there was another giant bridge here. 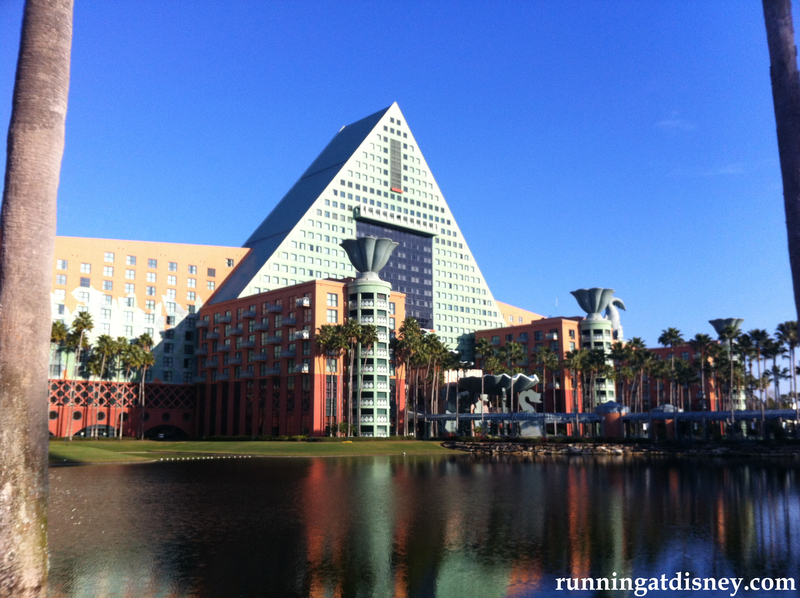 Let’s just say I chose poorly… But I did get some nice pics of the Swan and the Dolphin hotels, so it wasn’t a total loss. Instead of heading back over that hateful bridge, I decided to bear right at a path that went next to the Swan which I figured headed over to the Studios. I saw 2 other runners go that way, so I knew it couldn’t be that bad. That was until I saw the path come to an end. Thankfully those other runners were in front of me, so I could see where to go. The sidewalk went up and over another over pass (a super steep one I might add), but this time it was E Buena Vista Drive…a very busy road. I was totally confused and really should have planned this better. Once I crossed over the waterway, I was FINALLY on the right trail. 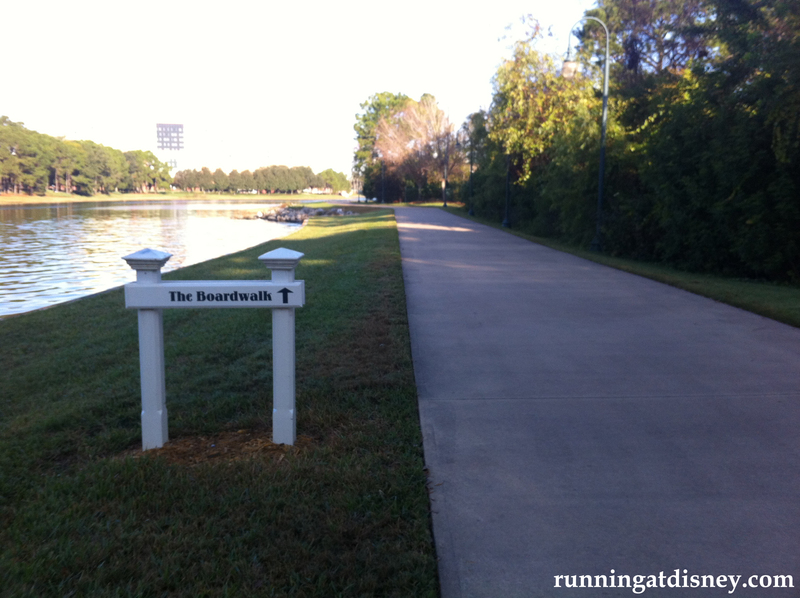 This is the primary walking trail that leads from the Epcot resort area to Disney’s Hollywood Studios. 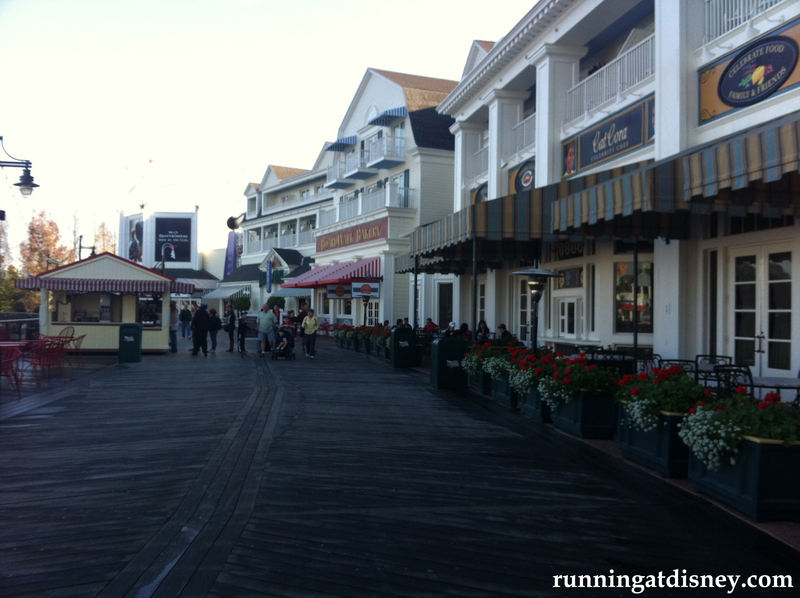 There were a few more runners on this side and also some early birds heading to DHS for rope drop. This side also had a lot more shade since the sun was starting to get strong. I LOVE this path. DHS is my favorite park and this give such a wonderful preview. You can see Tower of Terror looming in the distance and hear the various movie soundtracks faintly in the background. It looked like they had just washed down the boardwalk when I got back to the Boardwalk Hotel. I think this is where hurt my leg because it was a little slippery. It was either that or all of the overpass hills. Either way, this is where I remember the pain starting. It wasn’t only the wet boardwalk that made it difficult, the smells coming from the Boardwalk Bakery were SO good that all I wanted to do was stop and get a cinnamon roll! This area had a much higher energy and was more crowded than the rest of the trail, so keep that in mind when you’re running in this area. I made my way back to the Beach Club and ended up doing 2.3 miles. This is a little farther than the what is on the trail map, but that’s because I got lost. 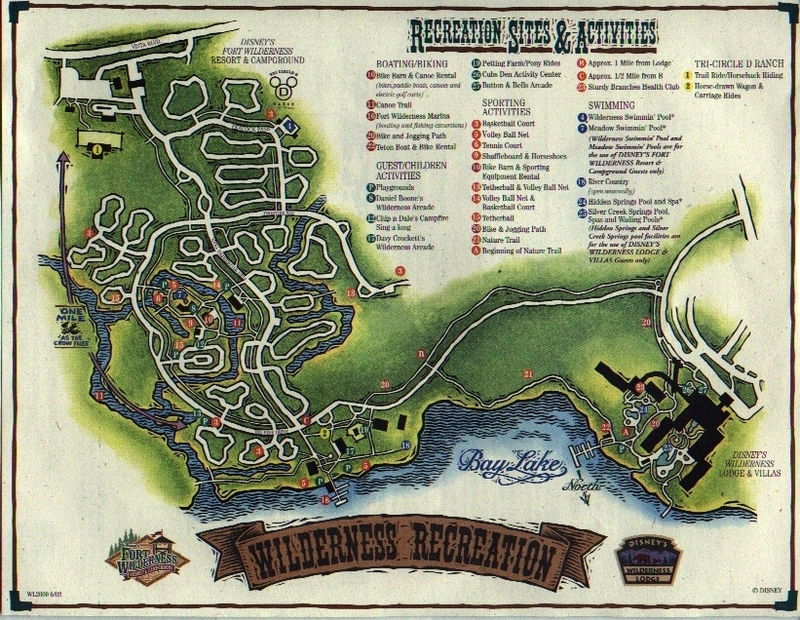 There are a lot of walkways in this area, so make sure you look at a map before you head out. You can get one at any of the front desks of the resorts in this area. Even though I personally have a bit of a bad association with this trail, I still love it. It’s absolutely beautiful and offers such varied scenery that you will never get bored on this run. I will definitely give it another try on a future visit. 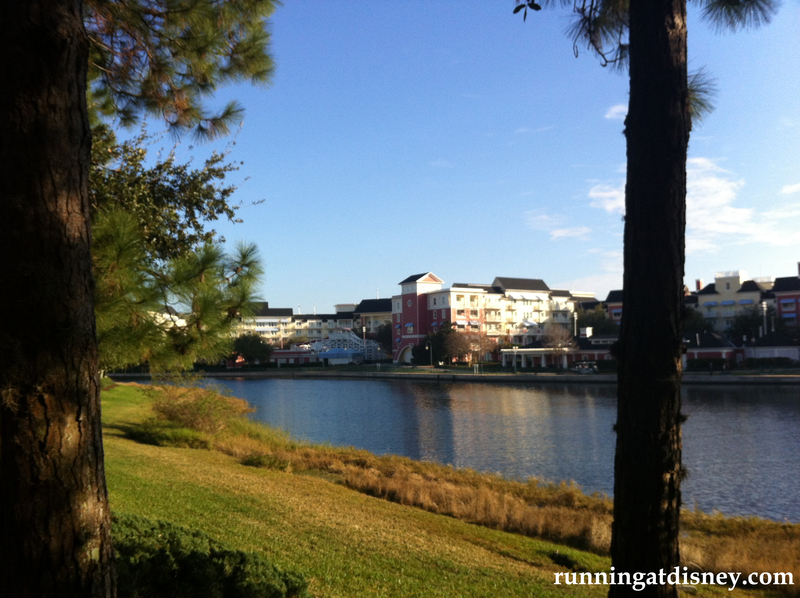 Have you ever run the Epcot resort area jogging trail? Share your experiences! 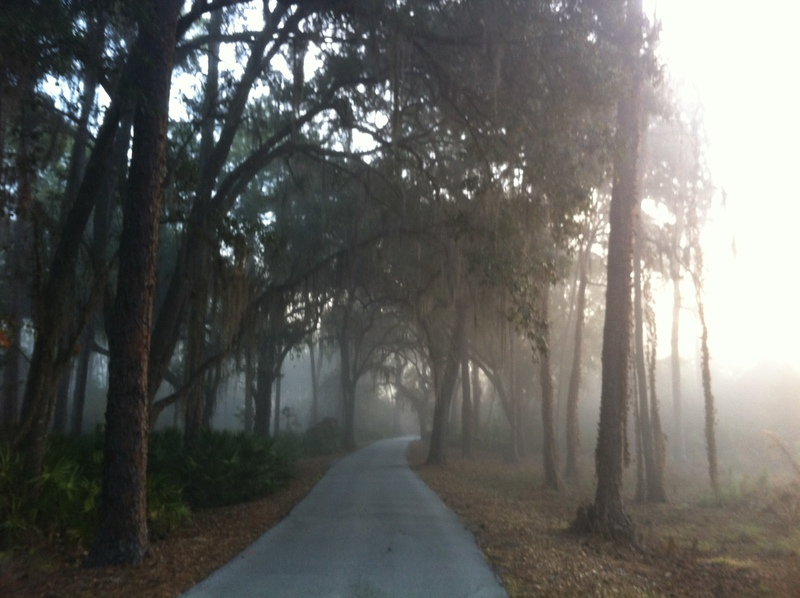 Last week during our stay at the Villas at the Wilderness Lodge, I got up early one morning and went for a run on the exercise trail. 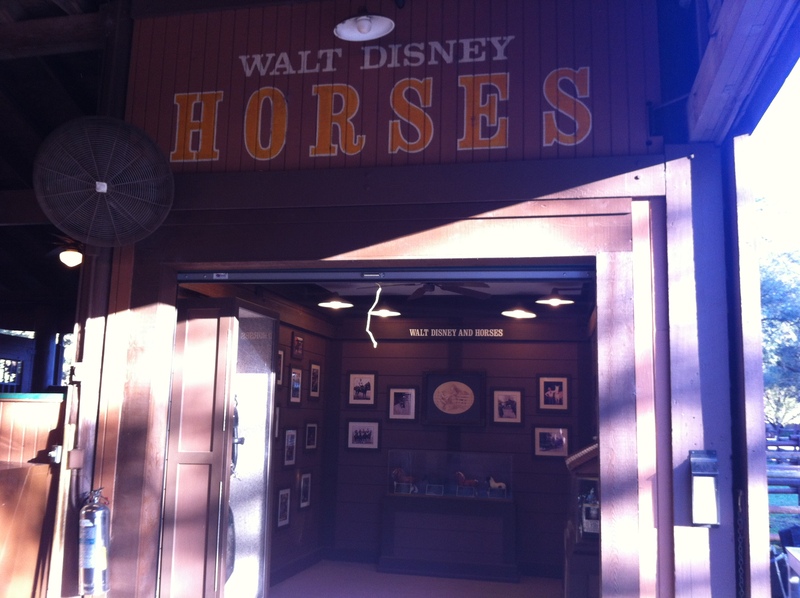 It starts at the Wilderness Lodge and goes over to the Fort Wilderness Resort & Campground. This was definitely one of the major perks of staying at the Wilderness Lodge and I had been looking forward to this run in the weeks leading up to the trip. When we checked into the hotel, I asked for a map of the exercise trail so I could get familiar with where I was going. 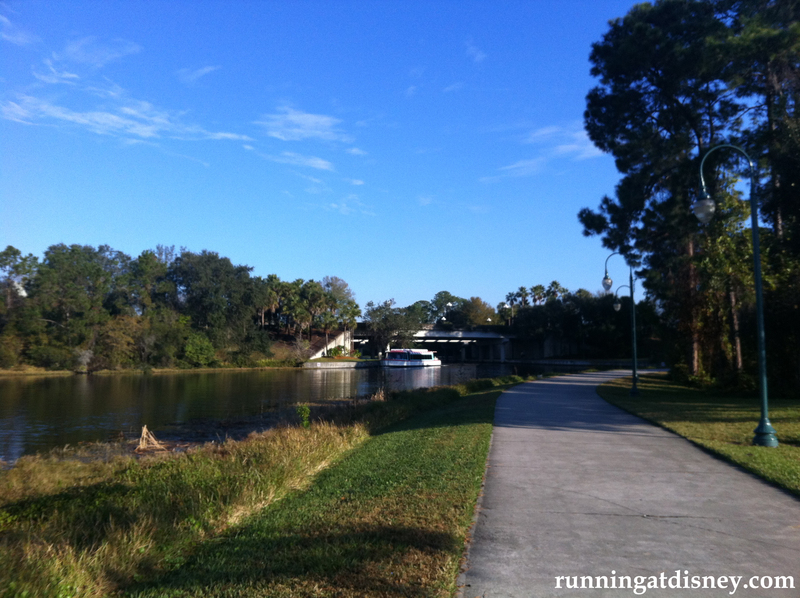 I haven’t spent much time in Fort Wilderness, so I didn’t want to be running in circles. 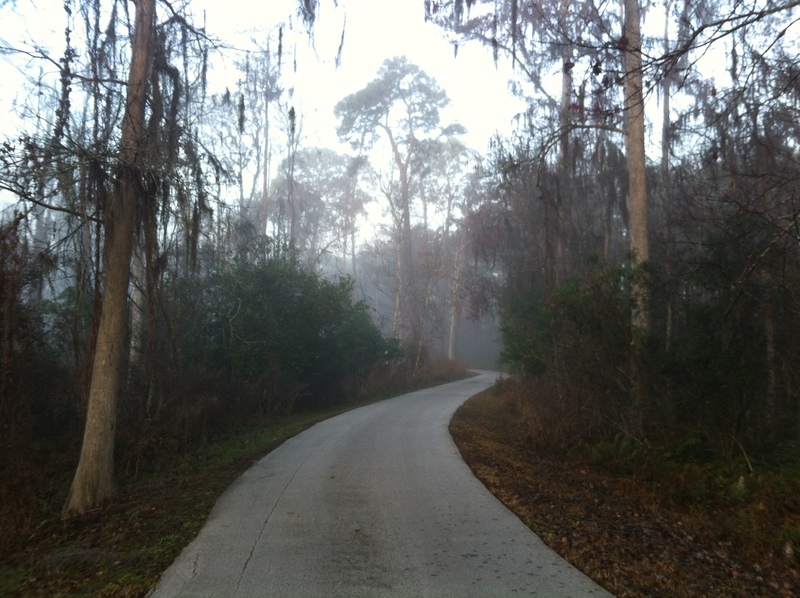 It was a cool, foggy morning and I went out just after sunrise. Guests were coming back to the Villas with fresh cups of coffee and breakfast from Roaring Fork, and the buses were just beginning to roll in. 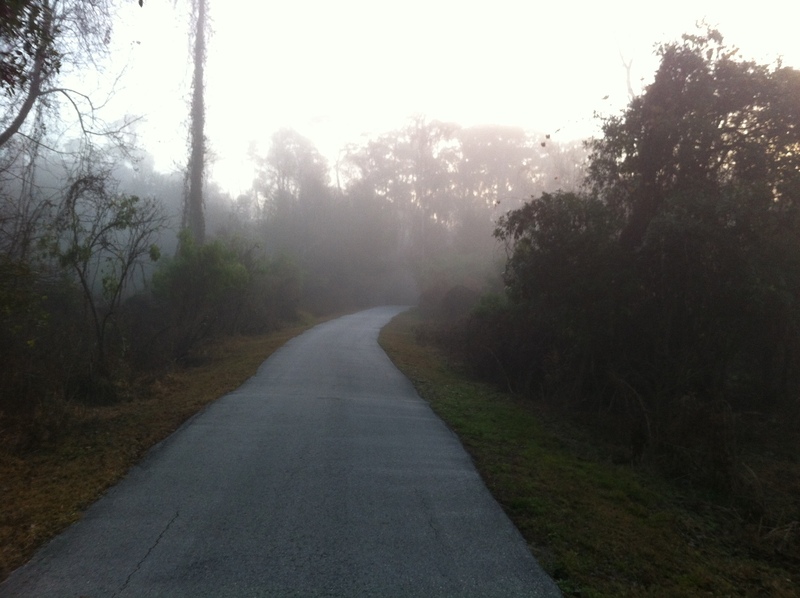 I had been on this trail once before when hubs and I did the Wilderness Back Trail Adventure Segway Tour on our honeymoon, but being out this early in the morning was just breathtaking. 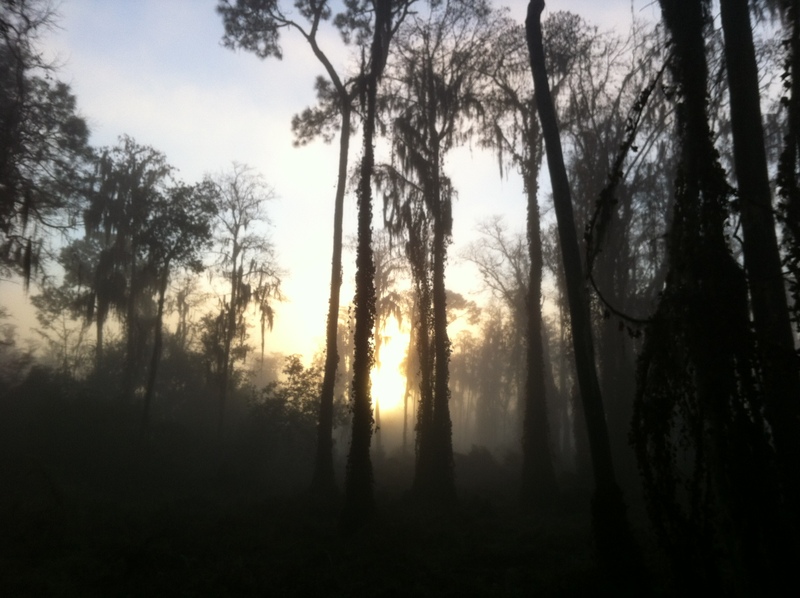 The sun was just peeking through the trees and trying to burn off the morning fog. It was a little eerie, yet beautiful at the same time. 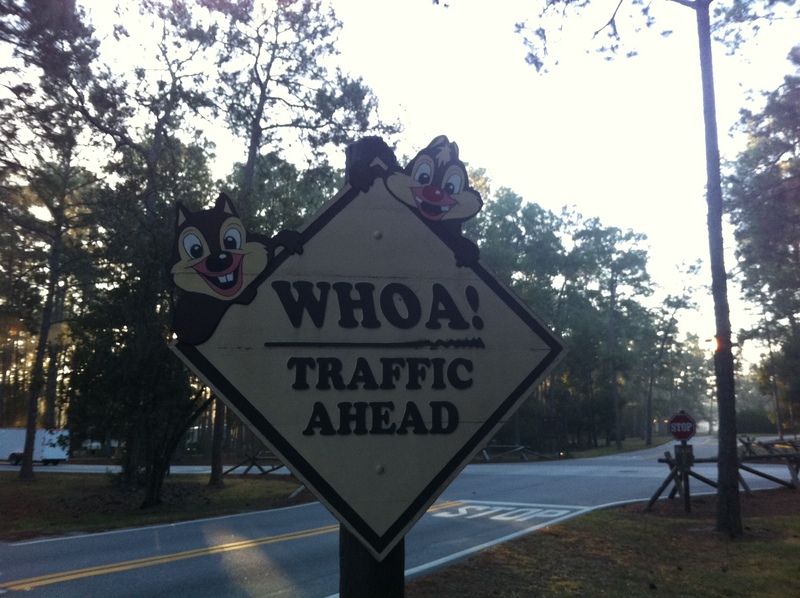 On my way over to Fort Wilderness, I saw some pretty amazing things. 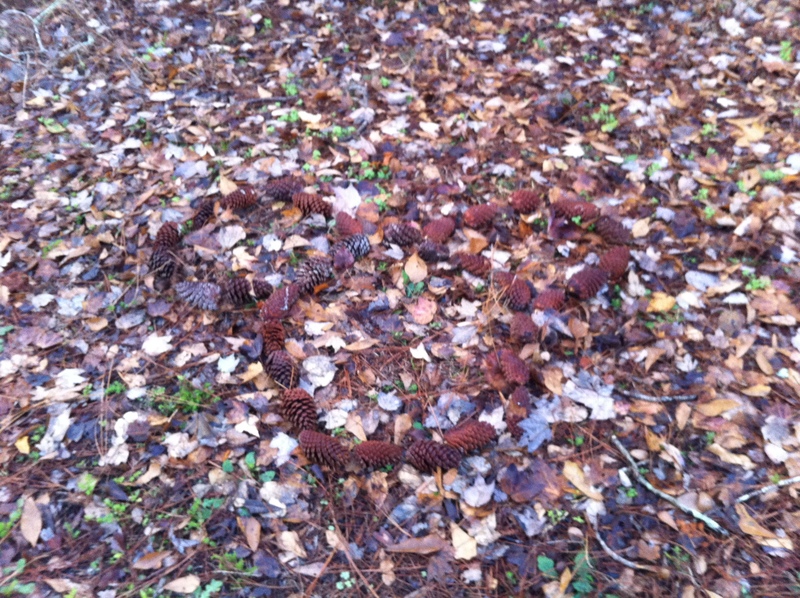 Near the beginning of the trail, I saw a grouping of pinecones out of the corner of my eye. On closer inspection, I realized they were in the shape of Mickey Mouse! What a cool hidden mickey find. I sent the picture to Steve Barrett, the Hidden Mickey Guy, and even he hadn’t seen that one. Another great thing about this trail is all of the wildlife. I saw more squirrels and birds than I could count, and I even saw a woodpecker. 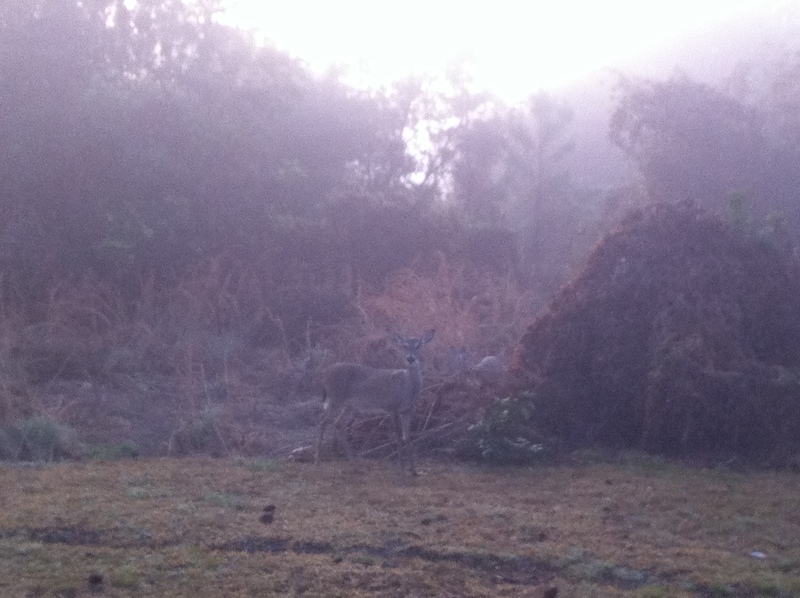 But the best wildlife sighting was a mother and a baby deer out for breakfast. It was like Disney planted them there. 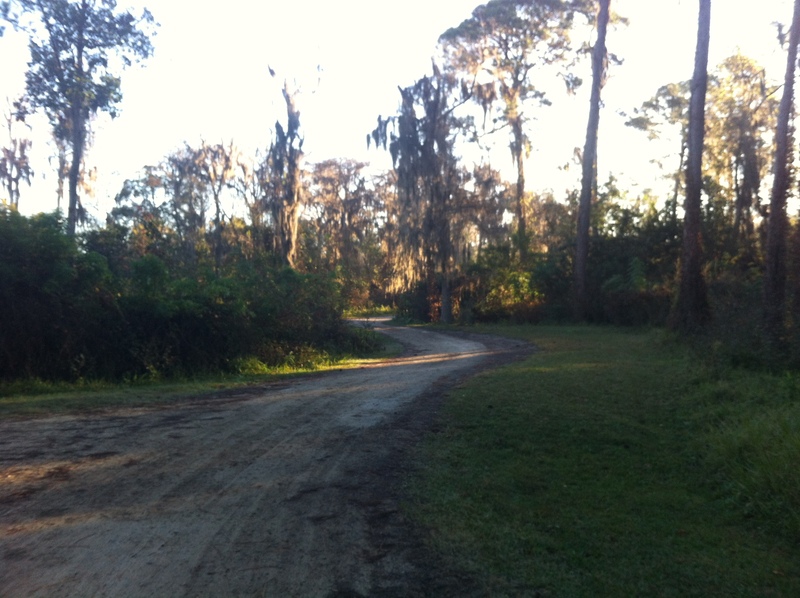 When I entered Fort Wilderness, I stayed to the right and headed down Fort Wilderness Trail. 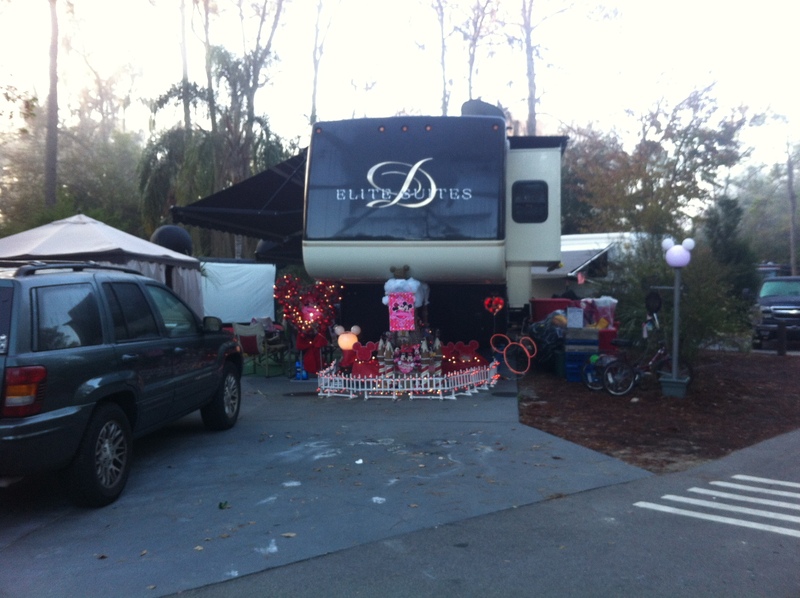 The first thing I saw was a huge trailer that I think was larger than my house, all decked out for Valentine’s Day. It’s so great how the residents in the Campground get very festive for all of the holidays. I loved this part of my run. There was so much to look at and the sidewalk wound in and out of the trees. The only difficult part were all of the delicious breakfast smells that were coming from the trailers! It was really making me hungry. Even after looking at the map before my run, I still was unsure of where I was going. I didn’t know the name of the road I had to turn down to head back to the main exercise trail. Luckily there were a few bus stops along the way that had maps of the resort so I could figure out where I was. I found Big Pine Drive and headed back up towards the Settlement Trading Post, all the while watching for chipmunks along the way. When I got back up to the Settlement Trading Post, I noticed a sandy nature trail off to the right. I remembered taking this trail on our Segway tour and that is offers a great view of Bay Lake, so I took off down the trail. As I got closer to the lake, the sand got a bit deeper so I took it easy because I didn’t want to twist my ankle since I had a lot of park touring to do that day! 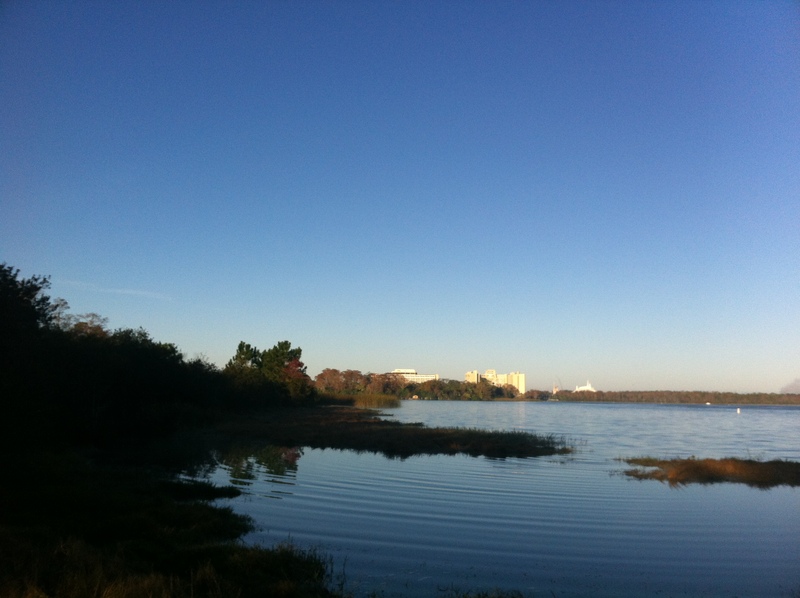 When I got to the end of the trail, I was greeted by a phenomenal view of Bay Lake with Space Mountain and the Contemporary Resort in the distance. This was also a great place to enjoy the peace and quiet for a few minutes and stretch a little bit. 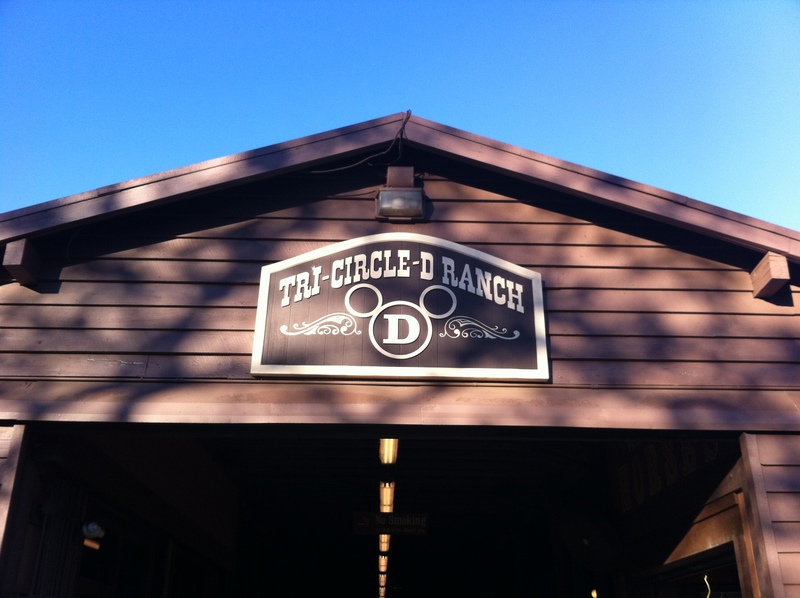 Before I headed back to the Lodge, I took a detour past Pioneer Hall and over to the Tri-Circle D Ranch to say hi to the horses. According to my Garmin, round trip my total run was 3.5 miles. At that time of day, there weren’t many other people out on the trail. I think I saw about 8 other runners. Later in the day, I’m sure it gets a bit more crowded with bikes, Segways and even horses. I just can’t say enough good things about this trail. The whole run was incredibly peaceful and there was so much to see along the way. 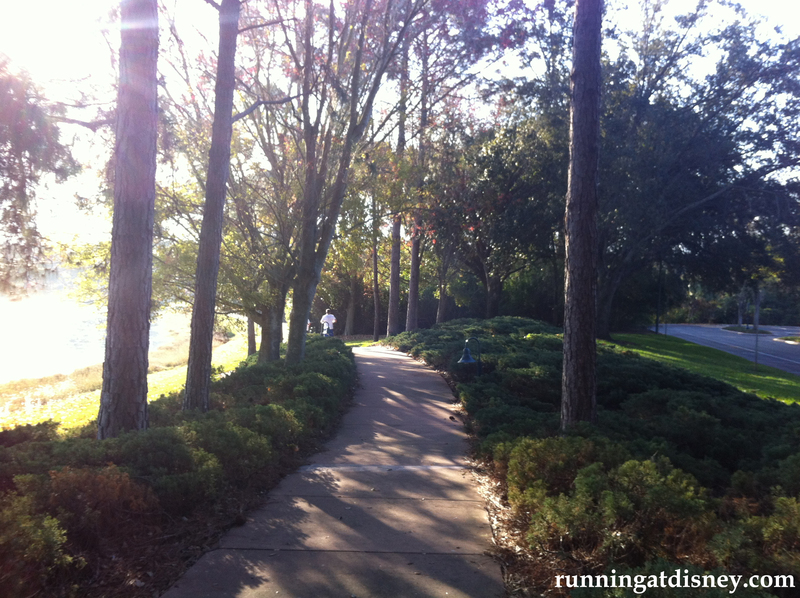 If I had a trail like this at home to run on, I think I would train more frequently! 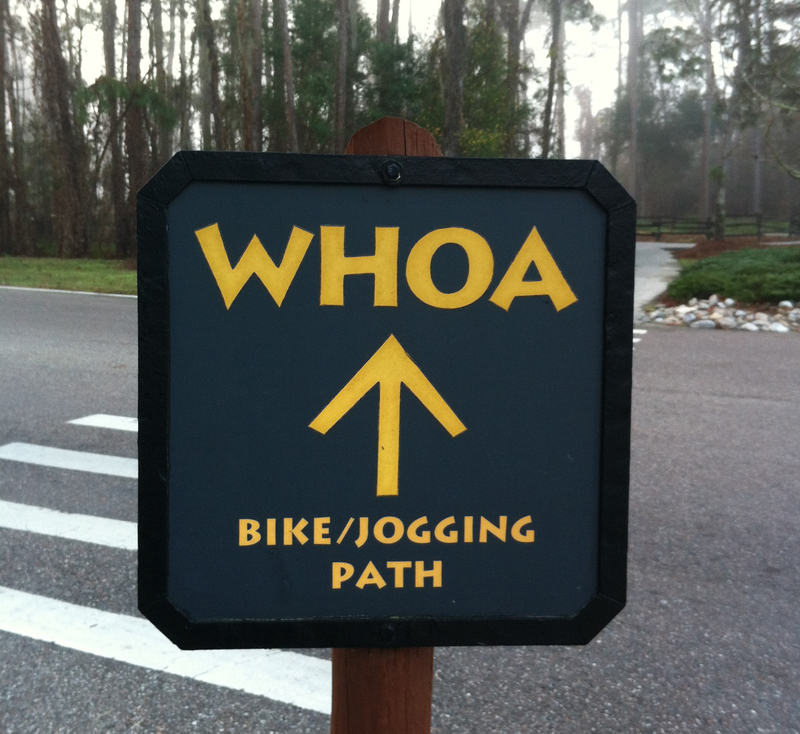 You definitely need to check out this trail next time you’re in Walt Disney World. 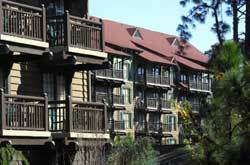 Even if you aren’t staying at either resort, it is worth taking a trip over just to take in the scenery. I’m Going to Walt Disney World! I’m writing this 38,000 feet up in the air en route to Walt Disney World for a much needed break from the cold weather of the Northeast. 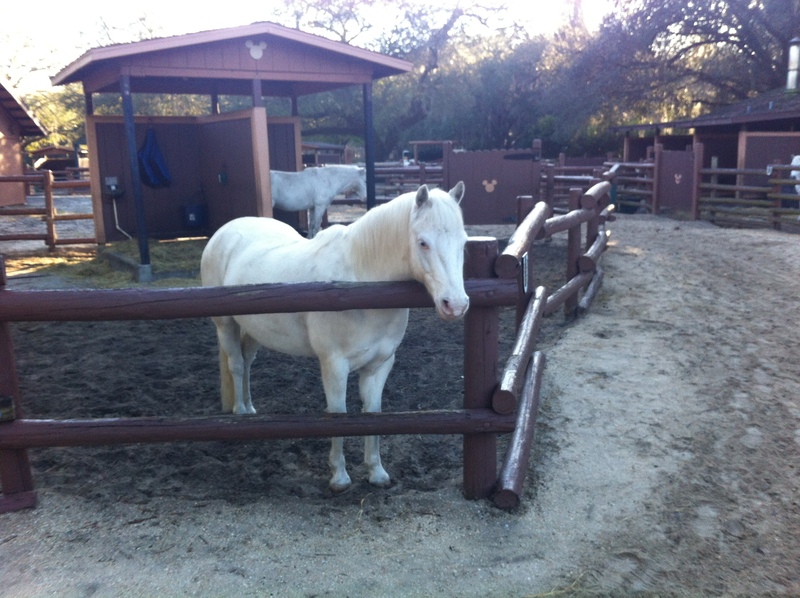 Most of my trips are very hectic with meets, activities and meals planned from dawn until the wee hours of the night. This will be the first trip that I will actually be taking time to relax and enjoy some down time with my husband and our amazing friends. There will be mass amounts of food and vino consumed. It could get ugly…you may not want to watch. But you know you’ll want too. I’m also hoping to get a few runs in while I’m down there. Due to my usual busy schedule on other trips, this has been completely out of the question, so I’m planning on taking full advantage this trip. 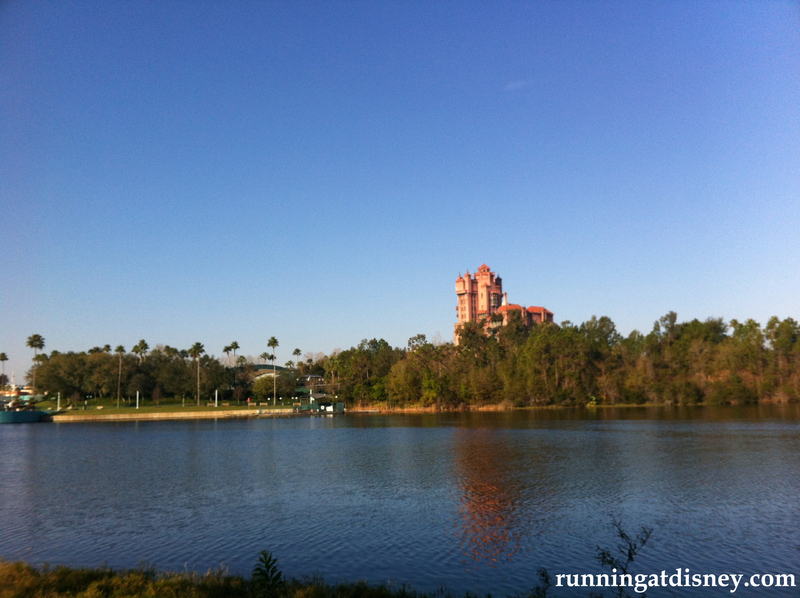 We’re staying at the Villas at the Wilderness Lodge, which has probably the best running trail on all of WDW property. 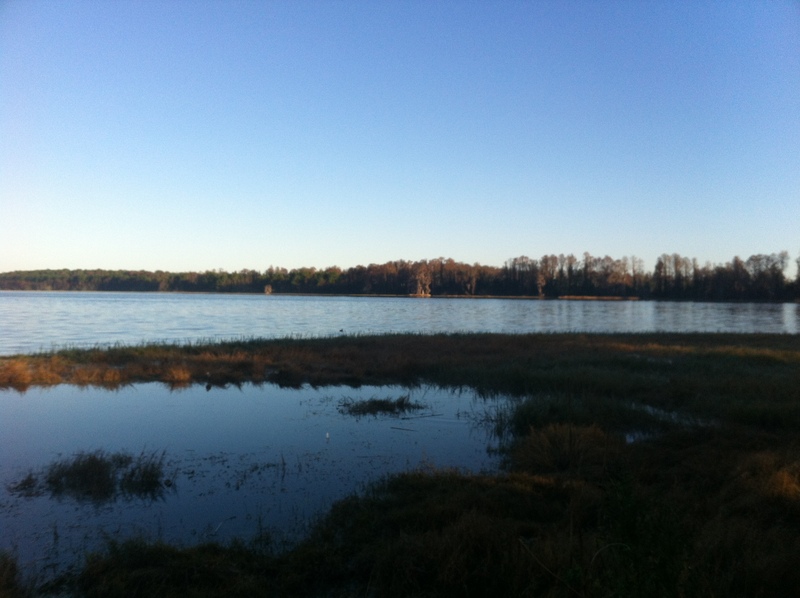 A beautifully wooded trail winding through the Florida “wilderness” takes you past Bay Lake and over to the Fort Wilderness campground. From maps I’ve seen, the distance should be about 2.5 miles round trip. 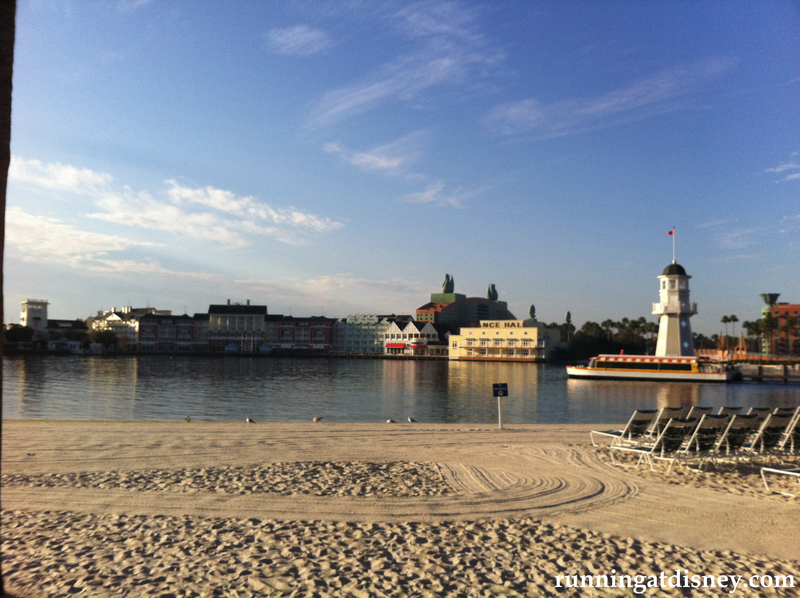 Perfect for a good morning run before heading to the parks! I’m also hoping to check out a few other running trails while I’m down there. 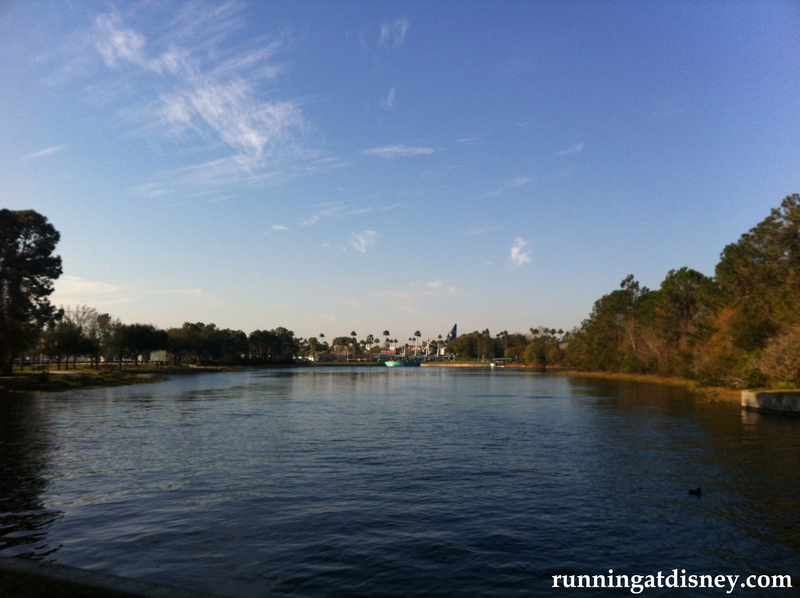 Possibly the one running along the Sassagoula River past the Port Orleans resorts, or Crescent Lake and down to the Studios. 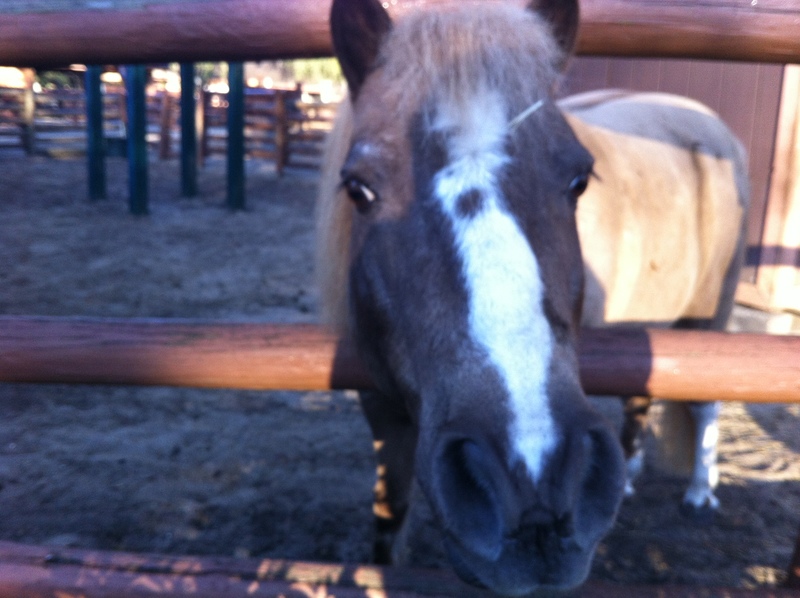 Wherever I make it to, be sure to check back for reviews of the trails when I get back. Make sure to follow me on Twitter at both @RunningAtDisney and @Duchess_99 while I’m in WDW for updates on the resort and many, many photos!